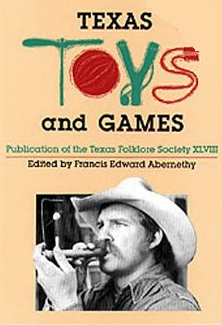 Texas Toys and Games combines how-to descriptions and reminiscences to produce a book that’s as much fun as Christmas morning—and not a single battery required! No molded plastic, mass-produced items in Texas Toys and Games. These are folk toys, made from natural or available materials, whatever is handy or can be scrounged. The folks who make them are amateurs of varying degrees, from the ten-year-old hammering together a skate scooter or box kite to the doting grandparent sewing doll clothes or whittling paired giraffes for a Noah’s Ark. Folk toys are made not to sell but for the challenge and joy of the craft, and each toy is an object of personal pride. Folk games encompass guessing, gambling, and counting out games; physically competitive games of chase, tag, and mock combat; skill games using sticks, stones, marbles, tops, and knives; variations of baseball, basketball, and football; and rhythmic clapping, rope-jumping, and dance-like games. Remember "Red Rover," "King of the Mountain," and "I Spy"? And "Mumbletypeg," and "Drop the Hankerchief"?